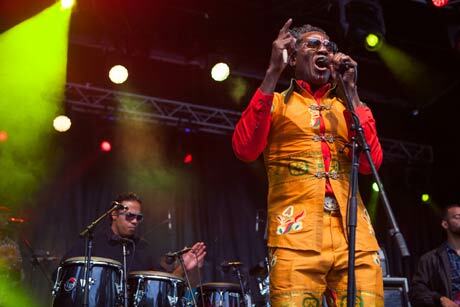 Having not performed in the city of Hamilton in almost ten years, Antibalas made sure no one in attendance would forget the incredibly tight execution of their enjoyable blend of Afrobeat with jazz, funk and improvisational music. The Brooklyn-based 12-piece ensemble were well-rehearsed, with each member quite proficient on their respective instrument in a band that included a four-piece horn section, four percussionists and two guitarists. Save for the occasional moment of showcasing their soloing chops, each player knew his role in working together to create the group's rich, textured sound. Extended jam pieces were held together by smooth grooves built upon the stable work of the talented rhythm section, but the onstage operation was spurred onward by the unwavering enthusiasm of lead vocalist Duke Amayo. While also doubling as one member of the percussion section, Amayo's call-and-response vocal chants were met with thunderous reception from the crowd in attendance.